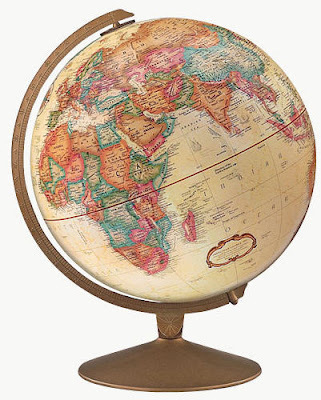 I've added a globe to my wishlist. We used to own one, but we gave it away a few years ago, which is unfortunate as they're a little pricey. There have been many times when I wished I had a globe at hand to look up the countries in a region of the world. Replogle's globes dominate the market. I think I'll go with their Franklin model show above, which is in the middle price range ($40). I like the antique look, compared to the standard Explorer. Having clearly marked country boundaries is important to me; this is not the case on the more expensive Atlantis, which focuses more on physical features. Do you have a globe at home? What kind? posted by Jonathan at 4/29/2009 11:11:00 p.m.